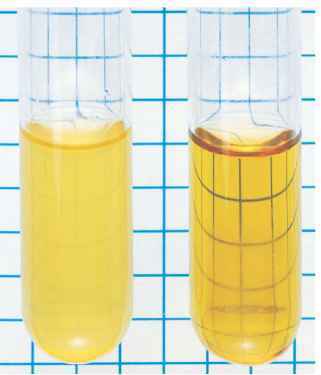 Figure 4.16 Measuring Turbidity with a Spectrophotometer (a)The cloudiness, or turbidity, of the liquid in the tube on the left is proportional to the concentration of cells. 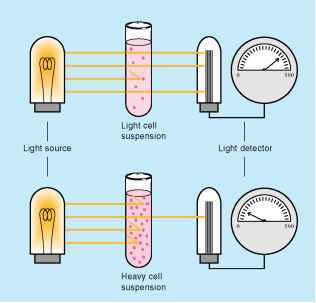 (b)The percentage of light that reaches the detector is inversely proportional to the optical density.To use turbidity to estimate cell number, a one-time experiment must be done to determine the correlation between cell concentration and optical density of a culture. decrease in pH that accompanies the production of CO2 increases the fluorescence. A method routinely used in the laboratory is to include an inverted small tube, called a Durham tube, in a broth of sugar-containing media. If bacteria produce gas as a result of degradation of the sugar, bubbles will be trapped in the tube.